Schools and settings must provide support as soon as they feel a child/ young person needs it, this is described as ‘Early Help’. Early Help refers both to help in the critical early years of a child’s life, when the fundamental building blocks of future development are laid but also help throughout a child's, young person’s and family's life to respond, as soon as possible, when difficulties emerge in order to prevent problems from becoming entrenched or escalating. See the Intergrated Early Help Strategy for more information. Schools and settings have a duty to deliver ‘Early Help’ by making reasonable adjustments to their provision in order to meet the needs of children with SEND. This is done by following the ‘graduated approach’ to SEND support. This means that, in most cases, schools and settings are required to try a number of different strategies to support a child’s needs before considering an application for an Education, Health and Care (EHC) Plan. 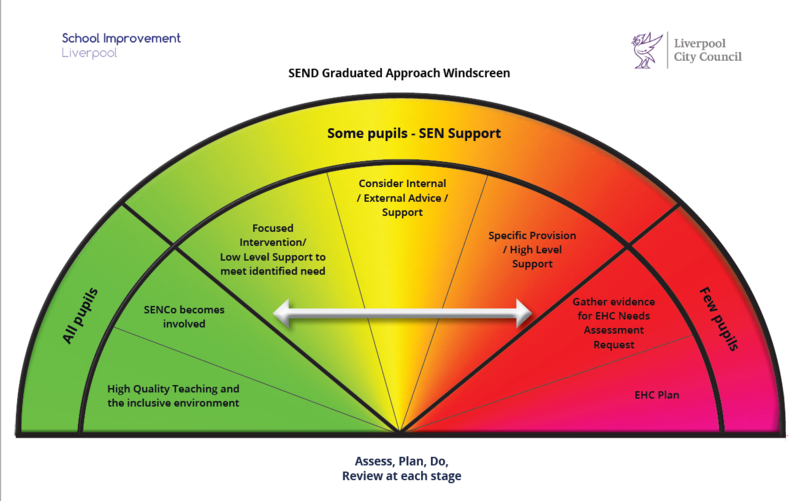 Schools and settings are required to provide or source the support outlined in the green and amber sections of the ‘windscreen’. This might include small group support, support from external agencies such as SENISS or Speech and Language Therapy or some financial support as part of the High Needs Top-Up funding system (For more information visit the High Needs Banding and Top Up). The person who will take the lead in coordinating support for children with SEND is the School SENCO (Special Educational Needs Coordinator). Every school is required to have a SENCO with day-to-day responsibility for the operation of SEN policy and the co-ordination of specific provision made to support individual pupils with SEN. The SENCO provides professional guidance to colleagues and works closely with staff, parents and other agencies. The SENCO should therefore be the main point of contact for parents who have concerns regarding their child’s SEND. Sometimes, however, even when given support via the graduated approach, schools and families may agree that a child or young person needs a more intensive level of specialist help. In these circumstances, the young person, parent, school or other setting could consider asking the local authority for an Education, Health and Care (EHC) needs assessment for the child or young person. This assessment could lead to them getting an EHC plan. An EHC plan brings a child or young person's education, health and social care needs into a single, legal document. The child or young person must have special educational needs to be eligible for a plan. However, not all children with SEND will need an EHC Plan. EHC Plans are granted when there is evidence that a child requires more intensive, individualised support (beyond that which schools are able to provide independently) in order to make progress. A request for an EHC assessment can be submitted by schools, settings, parents or young people. Parents and young people can decide to request an EHC plan independently however schools and settings must have parental consent in order to apply. If parents or young people feel that a request for an EHC plan would be beneficial it is always best to work in partnership with the SENCO within the school or setting to make the request. However, if this is not possible, parents and young people can contact the SEN Team directly to make an request. Further information about the SEN Team and contact details can be found here – Special Educational Needs Assessment and Pupil Support Service. The process for applying for and receiving an EHC Plan is quite lengthy. The legal time for the process to be completed is 20 weeks, this begins when an application is received and processed by the SEN Team. When a request is received by the SEN Team it is classed as an ‘request for for an EHC assessment’. At this point further information from parents and schools may be requested. This information will then be used to inform a panel decision as to whether to begin the EHC assessment process. A panel decision is given within 6 weeks from receipt of an EHC request. If the Panel decision is ‘no to assessment’, parents and schools will be contacted with reasons why and an alternative way forwards will be offered. If parents disagree with this decision, they are able to appeal against it and will be offered details of how to do this in their response letter from the SEN Team. 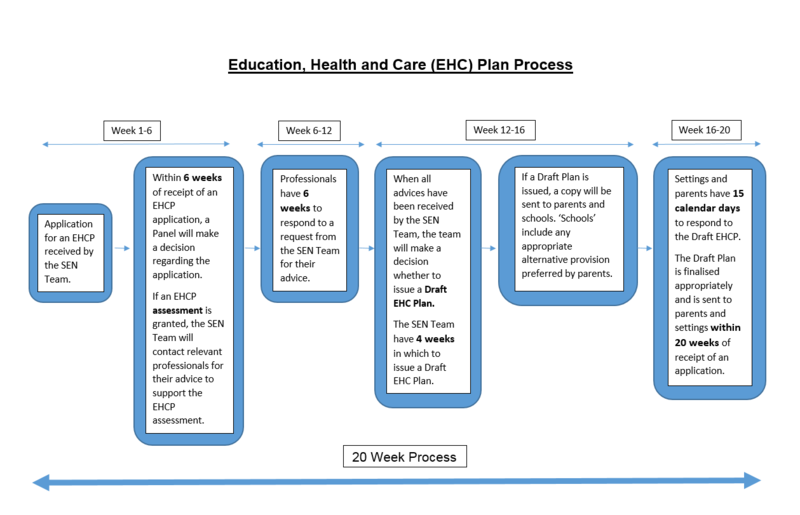 If the decision is ‘yes to an EHC Plan’, a Draft EHC Plan will be issued to parents, settings and health professionals within 16 weeks from the beginning of the process. Parents/ young people will receive a phone call from the SEN Team before the Draft EHC Plan is issued to discuss the possibility of alternative educational settings and the possibility of a Personal Budget. If alternative educational settings are suggested, the Draft EHC Plan will also be sent to these alternatives for their consideration. Parents and schools/settings have 15 days in which to consider the relevance of the plan and provide their response. Once the Draft Plan has been approved and the educational placement has been agreed, a Final EHC Plan will be issued within 20 weeks from the start of the process. An Education Officer from the SEN Team will work with you throughout the EHC assessment process. Once a request for an EHC assessment is processed by the SEN Team a letter will be sent to you stating the name of your assigned Education Officer and their contact details. Education Officers from the SEN Team have an in-depth knowledge of SEND provision within the Liverpool area and so will be able to support you in considering appropriate provision for your child. Education Officers will do everything they can to enable your child to receive the provision required to meet their needs. When considering provision in terms of school placements, Education Officers will discuss the range of schools available in the Liverpool area with you and will help you to consider the most appropriate setting for your child. Once an EHC Plan is completed and appropriate provision has been agreed, a Final EHC Plan will be issued. The Final EHC Plan will name the agreed school that child will attend. This school will then have a legal obligation to deliver the provision outlined within the Plan. All Final EHC Plans are reviewed annually by school staff during an Annual Review meeting to which parents/carers and the young person are invited. If there are particular issues to be discussed during the Annual Review meeting an Education Officer from the SEN Team can attend if agreed in advance of the meeting with the individual Education Officer dealing with the case. Following the Annual Review meeting, schools will send the Annual Review paperwork to the SEN team who will consider the contents. If amendments to the EHC Plan are required as a result of the Annual Review the Education Officer will issue a ‘Proposal to Amend’ letter to school staff and parents. This letter will outline the proposed changes to the EHC Plan. Once these changes have been agreed an Amended Final EHC Plan will be issued to the child’s parents/carers and school. In some cases it may be necessary to hold an ‘Emergency Annual Review Meeting’. These meeting are quite rare and, as the name may suggest, are called in times of emergency such as if the child’s placement is beginning to break down. Other than the timing and paperwork of these meetings, the process is the same as that of an Annual Review meeting. An EHC Plan can be in place to support a child/young person’s needs until the age of 25 years if they're still in eduction or training and making progress. Once a child/ young person reaches the age of 16 years, there are specific Education Officers within the SEN Team who are highly experienced in supporting this age group. Cases are therefore transferred to these Officers at this point. Further information regarding EHC Plans Post 16 and details around transferring into adulthood can be found on the Post 16 Pages.